(Nanowerk News) PI’s new L-505 linear translation stage family is available with integrated linear encoders providing 0.05 microns and 0.005 microns resolution, respectively. The new design allows for very compact multi-axis assemblies, at affordable prices. Many motor and drive variations are available, from fast DC-servo motors with linear encoders and low-friction ball-screws to simple open-loop stepper motors. L-505 Miniature Linear Stage Family. Two basic layouts are offered: a shorter, lower profile version with a folded drive train (motor side-by-side with the platform) and a longer, narrow inline version. Both come in two travel ranges of ½ inch (13mm) and 1 inch (26mm). XY and XYZ combinations are also available. Four motor options are available: servo and stepper motors in direct drive or gearhead configurations. In addition to the entry level open-loop stepper motor variants, closed-loop models with integrated linear encoders are available. 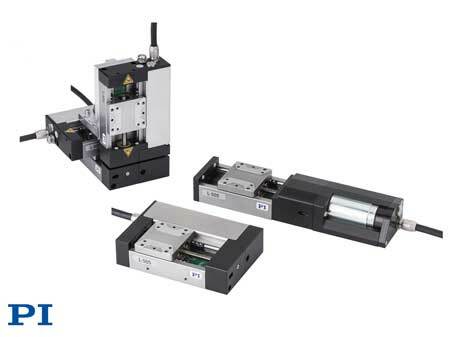 Linear encoders provide direct position measurement at the motion platform and provide better accuracy and repeatability compared to conventional motor shaft-mounted rotary encoders. Encoders with 50nm and 5nm resolution are offered. The direct drive versions can achieve velocities up to 15mm/sec, the gear-motor versions up to 1mm/sec. The video shows an XYZ-setup of the M-505 miniature linear positioning stage with integrated linear encoder. A compact XYZ piezo scanner can be added for nanometer precise, high speed motion.